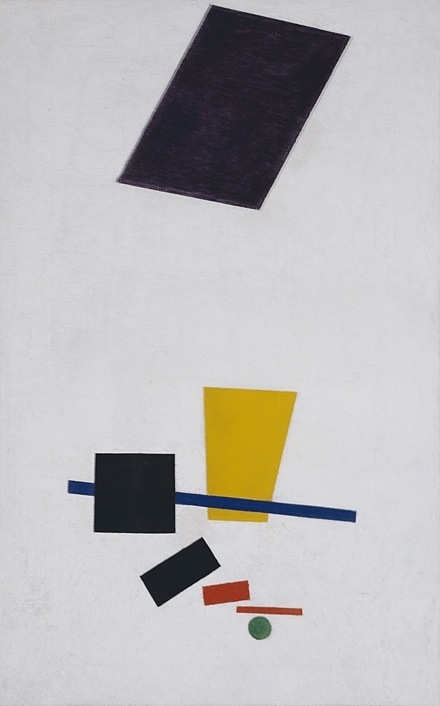 Through a collaboration with the heirs of Kazimir Malevich, the Gagosian Gallery is displaying six of Malevich’s paintings as the centerpiece in their current show, ‘Malevich and the American Legacy.’ Surviving paintings by this trailblazer in geometric abstract art are a rarity, and it is uncommon to see them on display outside of a museum. ‘Malevich and the American Legacy’ affords viewers some intimacy with these influential paintings while displaying works by a sampling of the artists Malevich inspired, including Carl Andre, John Baldessari, Alexander Calder, Dan Flavin, Donald Judd, Ellsworth Kelly, Agnes Martin, Barnett Newman, Ad Reinhardt, Ed Ruscha, Robert Ryman, Richard Serra, Frank Stella, James Turrell, and Cy Twombly. 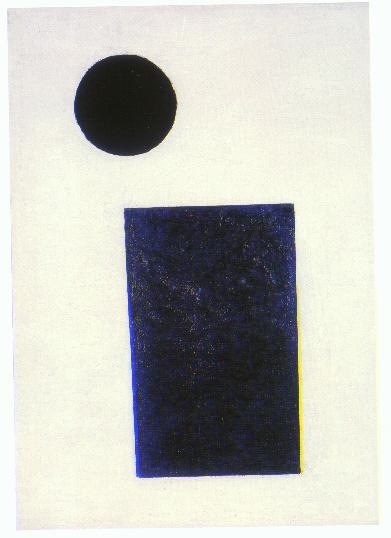 During the early 1900s, Malevich laid down the guidelines for the new art form of Suprematism. Stripped of all attempts of representation of physical objects, the base forms of Suprematist art are simple shapes: the square and the circle. 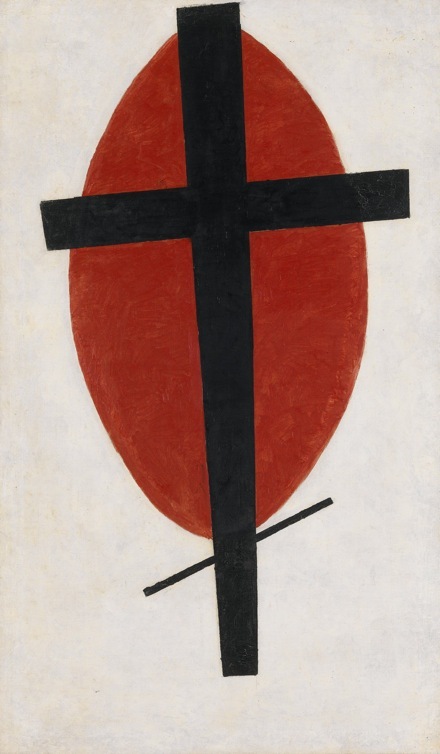 In Mystic Suprematism, a black cross lays over top of a red oval on a white background. Through its simplicity coupled with the power in its title, the piece stands for the approach of bareness and basics that Suprematism reaches for. 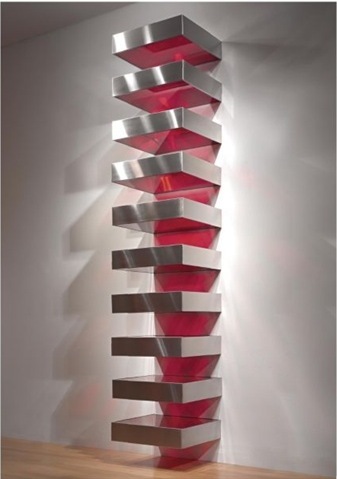 The pure geometric shapes, hard edges, and simple palette take art to a new level, one that does not blur lines or imitate a dimensionality off of the canvas. In a time of political unrest in Russia, his adherence to abstraction left his paintings among those banned for not accurately depicting reality. One piece on display, Painterly Realism of a Football Player, is a recent acquisition of the Art Institute of Chicago. Through Larry Gagosian and the Gagosian Gallery, the Art Institute arranged the acquisition from the heirs of Malevich. Painterly Realism of a Football Player is one of a group of paintings that Malevich made for a 1915 exhibition, 0.10 (Zero-Ten): The Last Futurist Exhibition of Painting. This series, made in secret, focused the ideas of Suprematism and followed in the vocabulary of shapes and colors Malevich had set up. Of the 21 original pieces that were in the 0.10 exhibition, 9 were destroyed during the Soviet Union’s cultural oppression. Painterly Realism of a Football Player exemplifies Malevich’s goal of purity and non-representational art: though it refers to the natural world in its title, all realist forms are banished on the canvas of free-floating shapes and lines. With this image, he even disregarded the conventional assignments of directionality in art—the canvas is reported to have been displayed in two different orientations during his lifetime. Since his first retrospective in the United States, Malevich’s impact on American art has increased significantly. The forms to which Malevich turned reappear in the hard edges and simple chromatics of paintings by Ellsworth Kelly, with his repeated geometric patterns, and Barnett Newman, whose monochromatic paintings concentrate on starkness and division. 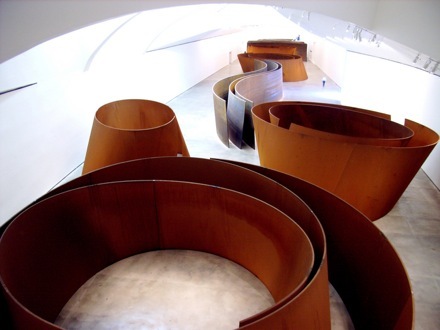 And the intention has expanded into three dimensions with Richard Serra’s imposing sheet metal sculptures, which hold simplicity in the root of their impact on the viewer, and Donald Judd’s stacked sculptures made of plain industrial materials. 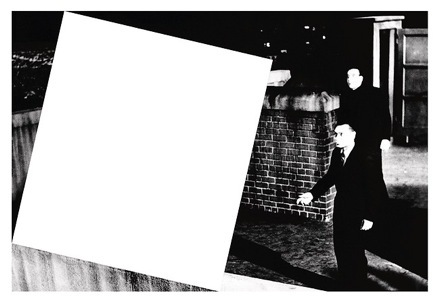 A clear dedication to Malevich is in the title of Baldessari’s Two Stares Making a Point but Blocked by a Plane (For Malevich), in which a white square has been lain over top of a photograph, creating a lacuna in the space where the two men in the photograph are looking. The imposition of the square reminds the viewer that the photograph is simply a two-dimensional representation. The rise in those following these rules of abstraction so similar to what Malevich envisioned marks the gravity of his work. 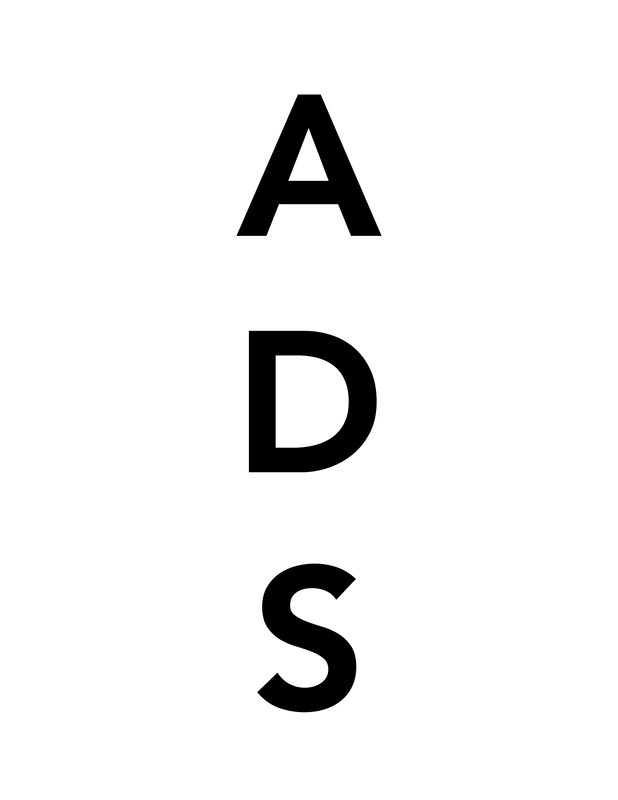 This entry was posted on Friday, March 11th, 2011 at 12:01 am	and is filed under Go See. You can follow any responses to this entry through the RSS 2.0 feed. You can leave a response, or trackback from your own site. 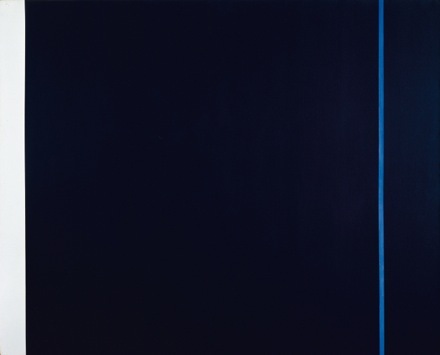 There is a less-than-stellar piece by Judd on display at the Palm Springs art Museum from the Macmillan Collection but the work of Craig Baskin, (not certain if he is Leonard’s son), most certaintly channels Malevich. 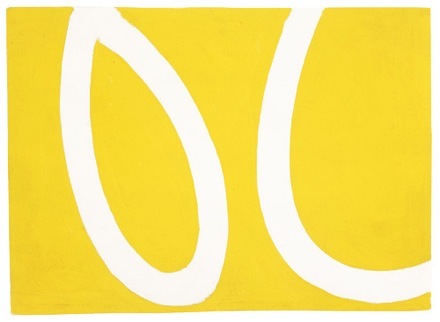 Ellsworth Kelly’s yellow is sublime.